Personal Injury - Buell & Elligett P.A. Free initial consultations. No fees unless we win. Buell & Elligett, P.A. offers clients the comfort of knowing that they have a dedicated trial advocate at their side. Our practice is distinguished by the distinctive victory-driven team approach we use to analyze, prepare and try cases. Each client works with a board certified trial lawyer and a board certified appellate lawyer. This approach allows us to raise the substantive claims and take the procedural steps needed to preserve and present your case. We are attorneys who take on personal injury cases that other attorneys may turn away. We accept personal injury cases at no upfront cost to the client. We pay all of the initial filing fees and investigative costs. We get paid a fee only if you receive a settlement or money judgment. Motor vehicle accidents: Roadside collisions can leave drivers and passengers injured, in pain and financially strained. Our attorneys seek full and fair compensation for victims of accident and injury from the negligent party or their insurance company after an auto accident, motorcycle accident, truck accident, boating accident or related collision. Wrongful death: There is nothing worse than knowing that a loved one's death could have been prevented, had the proper precautions been taken. Buell & Elligett helps survivors seek full and fair compensation from the parties responsible for causing such injuries. Medical malpractice: Errors by a doctor, nurse or hospital can have devastating results for the patients. Our firm advocates for people who have been injured due to untimely or incorrect diagnosis or treatment, nursing errors, poorly trained technicians, surgical errors, incorrect prescriptions or other related medical errors. Sexual assault: Inadequate security, poor lighting, faulty locks, shoddy doors, and other failures on the part of a landlord or premises owner may have contributed to the assault. If you have been raped, you may be entitled to compensation from someone other than the person who assaulted you. Learn more about your legal options by reaching out to an attorney at our office. Slip and fall: Slippery floors, unexpected obstacles and broken pavement are just a few conditions that could have contributed to your slip and fall accident. If you have suffered severe or debilitating injury, the landowner may be liable for your financial losses. Contact our offices to find out if our attorneys can help you recoup your financial losses. Premises liability: When you are invited onto someone else's property, you are owed a duty of care. If you were injured on public property or while visiting a local business or neighbor, you may be entitled to a legal remedy. Our attorneys are ready to help. Products liability: Manufacturers, retailers and distributors have a responsibility to package, ship and shelf products in ways that reduce a consumer's exposure to illness or injury. If you purchased a product that caused you to become sick or injured you severely, our attorneys can help you seek full and fair compensation. Construction site accidents: Victims of injuries or death on construction sites may be entitled to compensation well beyond the modest amount provided through workers' compensation benefits, depending on the facts and circumstances surrounding the negligent acts. Buell & Elligett examines such serious injury or death claims to evaluate potential sources of full compensation. Pharmaceutical errors: Medicines prescribed by doctors generally must be filled by licensed pharmacists. We can help you exercise your right to compensation for prescription errors, adverse drug interactions and allergic reactions caused by improperly filled prescriptions. Nursing home injury: Signs of nursing home abuse and neglect include bruises, bed sores, dehydration, malnutrition, unexplained injuries, open wounds and unsafe or unsanitary living conditions. If you believe that a loved one has been a victim of nursing home injury, please contact our firm to find out what to do. For more information and an evaluation of your personal injury or wrongful death claim, please call (813) 874-2600 or contact us at your earliest convenience. Attorney referrals and associations welcome! Our attorneys also stand at the ready to serve as co-counsel to other law firms in complex personal injury cases. We are available to assist with motion filings and brief preparation as relates to personal injury and wrongful death cases. 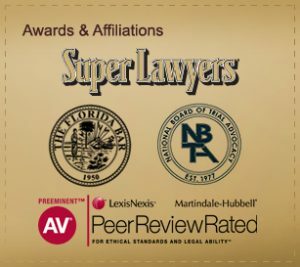 Our firm is proud to be home to three Florida Bar Board Certified Specialists: Mark Buell, Tom Elligett and Amy Farrior. We look forward to assisting in various capacities.